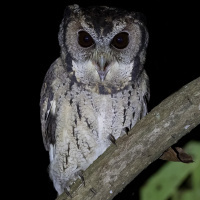 The Collared Scops Owl is a small owl with rather long, dark-spotted ear-tufts. 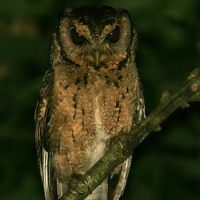 A grey-brown and a rufous morph are known to exist. Typical call - Thailand. © Dave Farrow. Description: The facial disc is dull yellowish with some faint darker concentric markings. The eyes are dark brown to orange-brown. The bill is greenish-horn, paler at the tip, with the lower mandible pale dusky yellow. 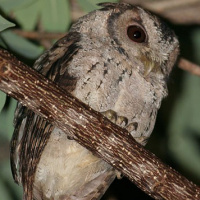 Upperparts are light buffish-brown, mottled, spotted and freckled with black and buff, as well as pale grey-buff (grey-brown morph) or Rufous-buff (rufous morph). The scapulars have pale buffish feathers, forming an indistinct strip on the wing. There are two pale collars on the hindneck. Underparts are pale brown with small arrowhead-like shaft-streaks. Tarsi are feathered to the base of the toes, which are fleshy-grey to dusky olive with yellowish-white pads. Claws are the same colour as the toes. Size: Length 23-25cm. Wing length 158-188mm. Tail length 75-102mm. Weight 100-170g. Females are usually larger and heavier than males. 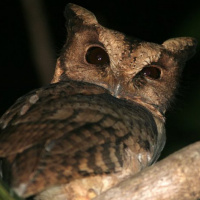 Habits: The Collared Scops Owl is a nocturnal bird, and is rarely seen by day. Roosts during the day on a densely foliaged branch, perched upright and motionless. Voice: Emits a single, mellow hoot "buuo", repeated at intervals of approximately 12-20 seconds. Singing may last 15 minutes or longer. Hunting & Food: Feeds mainly on beetles, grasshoppers and other insects, but will also take lizards, mice, and small birds. Breeding: Little studied. Breeding season is from February to May. Nests are in natural cavities or woodpecker holes in tree trunks or dead stumps, mostly at a moderate height of about 2-5m or more. Three or four eggs are laid, sometimes five, averaging 32.3 x 28mm. Habitat: Forest, scrub, second growth, also groves of trees and bamboo stands around habitations, open country and towns. Ranges from plains and submontane tracts to about 2400m elevation. Distribution: Eastern Himalayas from eastern Nepal east to Assam, south to eastern Bengal, Burma, Thailand, Hainan, southern China and Taiwan. Original Description: Hodgson, Brian Houghton. 1836. Asiatic Researches, 19, p. 176-177.